No.402 circa 1870, but where was it taken? What is the occasion? Who are the people? What is the loop on the top of the boiler for? What are the square boxes on top of the carriages? What class locomotive and carriages. Locomotive: No.402. Boiler, frames and cylinders were made by Messrs. Sharp, Stewart & Co. in 1854 and the remainder of the work including erection was done at Longsight Manchester, under the supervision of John Ramsbottom for the Manchester & Birmingham Railway . It was a 2-2-2 tender engine and one of probably only fifteen engines constructed at Longsight, although others were rebuilt there. 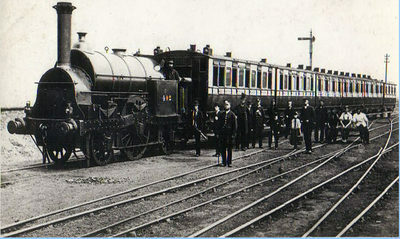 Originally No.2, it became Northern Division No.402 in August 1857. It was rebuilt as a 2-2-2 saddle tank in 1868 and renumbered in the duplicate as No.1856 in September 1874. It was scrapped in February 1879. The photograph was thus taken between 1868 and September 1874. The late Geoff Platt thought that the location could be outside Manchester London Road and behind the train could be the MSL South Junction home signal. There is so little to go on that I have no idea how he came to that conclusion. The carriages are typical LNWR of the period, but little seems to be known about them. They look like a close-coupled fixed set train. Is this a photo of the first West Coast sleeper set? I believe the service started in 1870. This photo has puzzled me for years. If anyone has a big sharp print there’s a destination label on the nearest carriage above the fifth window from the left (it’s unreadable on a postcard-size print) which might give a clue. It seems likely that it was taken somewhere in the Manchester area. Stockport and Ardwick Junction have been suggested; I don’t know on what grounds. The position of the sun to the right, and the rough stone wall at the left, with its long, rounded cap-stones, might help identify this junction. The tall top-hatted gent – looks like Abe Lincoln – fourth from the left on the ground, is perhaps the same man on the contemporary photos of Sharp No 457 (at Stockport) and DX No 1080 (at Manchester Victoria). If so, maybe he’s a pal of the photographer, or has arranged to have these photographs taken for some personal reason. I think that ring above the tank between the safety valve and the tank filler is the handle of a long fire-iron resting in the far-side fender. No. 402 was certainly shedded at Longsight at this time and the train is almost certainly from Manchester London Road to Cheadle, which was then the outer extremity of the local service, though it might be empty stock. It cannot be an Oldham to Cheadle train as they had less coaches and were worked by a Crewe Type 2-4-0 tank, because of the banks on that route. I once saw a print of this picture that had once belonged to C. Williams. It was brought to me by David Patrick and was one of a batch of pictures to be copied for the LNWR Society collection. On the back of it, in pencil in the writing of C. Williams, was �Stockport�. It is nowadays impossible to identify the exact location. The picture was taken between 1868 and September 1874, long before the major reconstruction which occurred in the 1880s, when the Stockport station was enlarged, Edgeley Junction greatly changed and Edgeley shed built. So it is now impossible to relate the picture to the modern layout or to the layout as it was in living memory. It could perhaps have been taken on the Stockport end of the viaduct, but that is doubtful, as behind the train is a stone wall with copings, whereas the wall at Stockport viaduct is of brick. It might be at Edgeley Junction itself, though there is no way of knowing. The approaches to London Road were also changed greatly after the date of the picture, when Mayfield was built and the whole track layout enlarged greatly. G.H. Platt might well be right in thinking it was taken by the MSJA junction at London Road but again the walls in that area are all of blue brick.